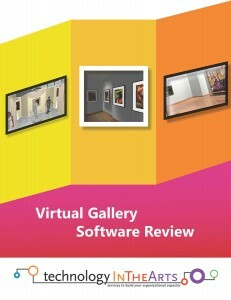 Technology in the Arts has published a free report, entitled Virtual Gallery Software Review, that reviews and compares three software applications—Virtual Galleries, Image Armada, and SceneCaster/3D Scenes—designed to help artists, curators, and art organizations create three-dimensional virtual exhibitions. This type of technology can provide not only a useful alternative experience for audiences that cannot physically attend a live exhibition, but it can also potentially help students and professionals learn about exhibition planning and installation. The task of building virtual galleries or exhibitions can often be daunting and costly. Despite software that facilitates the development of virtual environments for conferences, commercial expos, and education, solutions for creating virtual art exhibitions have been scarce. For these reasons, two important criteria for the study were ease of use and user-friendly design. The primacy of these criteria also prompted the researchers to exclude Second Life because of its steep learning curve for environment creation. Researchers looked for five features desirable in an application used by artists and arts professionals: ease of creating an exhibition; quality of images; flexibility of creating an exhibition; ease of navigation in the three-dimensional space; and ease of publishing or distributing the gallery. The report contains individual descriptions of the three applications, as well as comparisons of their features, such as Mac and PC compatibility, hardware requirements, internet-based viewing, and image and lighting manipulation. Technology in the Arts, an organization that explores the intersection of arts management and technology, offers services such as consulting, professional-development training, webinars, an online resource directory, monthly podcasts, and a discussion-based blog. It is part of the Center for Arts Management and Technology, an applied research center at Carnegie Mellon University exploring ways in which arts managers can employ online technologies to meet their organizational goals and engage audiences more effectively.